Assam (officially Axom), located south of the eastern Himalayas, is a northeastern state of India and is famous for its lustrous greenery, tea gardens and beautiful culture. Blessed with dense flora and fauna, this part of India is also the birthplace of legendary writers, political leaders, singers and genius in all fields. But this time, it is not the tea gardens or beauty of Assam that has made it enter the record books, but something else of this cultural city had attracted the focus of the media and the excitement of the Asia Book of Records team, and that powerful magnet was the scheduled feat of endurance to be performed by one Double Asia Book of Records holder and a Martial Arts practitioner from Assam. Full contact boxing for a continuous duration, be it on a punching bag or on a practicing pad, requires a lot of stamina and concentration on the part of the person who is performing it. However, in case of a practicing pad, it is the combined efforts of the boxer as well as the person who is holding the punching pad in front of him so as the boxer can continuously deliver punches on it. If the person who is holding the punching pad is not supporting the one delivering punches, then nothing more than a single punch in a single second on an average will be possible. But if both of the people are not focusing totally, then it might cause injury to both of them. 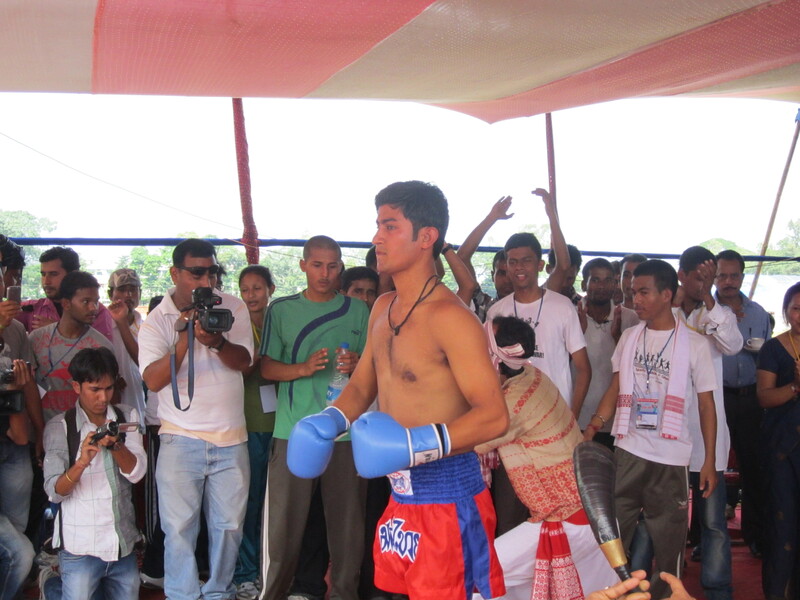 Despite being aware of all these harms attached to the tag of this form of sport, one Indian lad Abhijit Baruah, a cop and a kickboxing belt holder from the small town of Jorhat (Assam), was all set to deliver the most number of punches on a practicing pad in a minute, at Jorhat Stadium, on October 13, 2012. An excited Asia Book of Records adjudicator Ankita Borthakur, reached the Rowriah Airport (Jorhat) at the early afternoon of October 12, 2012, amidst the eye soothing greenery, just to have a glimpse of the feat of bravery that was to be attempted by an already confident claimant Abhijit. 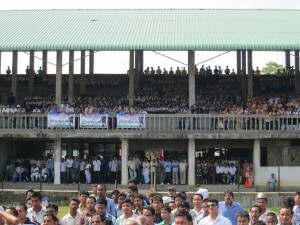 In the morning hours of the day of October 13, 2012 and in the presence of the huge gathering of fans, school children, noted dignitaries of Assam and the Asia Book of Records adjudicator, Abhijit entered the Jorhat Stadium with great motivation and a breath of confidence, passion and a smile reflecting his sincere efforts that he had put on for months. He started his attempt at an expected speed and with the fans continuously applauding for the brave heart. He delivered punches one after the other with the lightening speed and without stopping for any second. 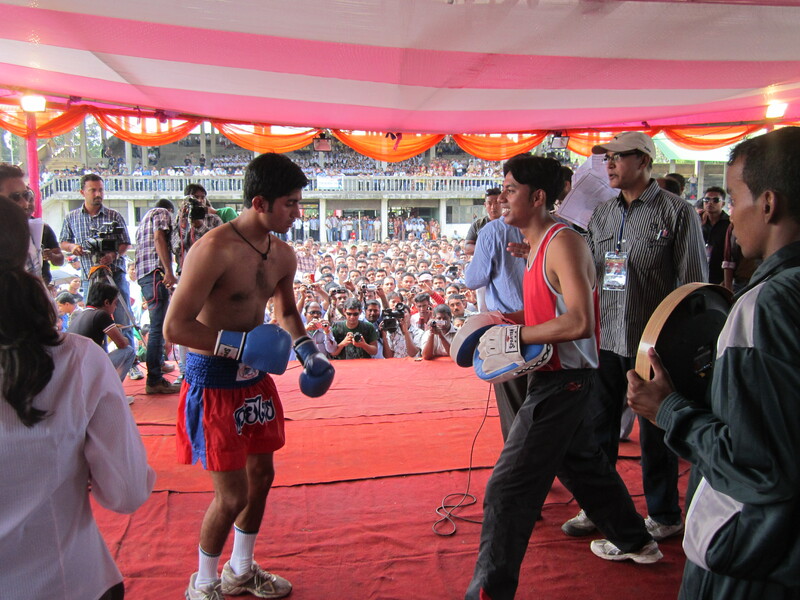 He was well supported by Jayanta Tamuli who was holding the punching pads for him. At the end of the already allotted time period of 60 seconds, the attempt was over. 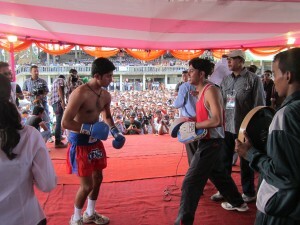 The adjudicator took their time to watch the video of 1 minute in ultra slow motion so as to count the number of full contact punches which Abhijit had delivered. 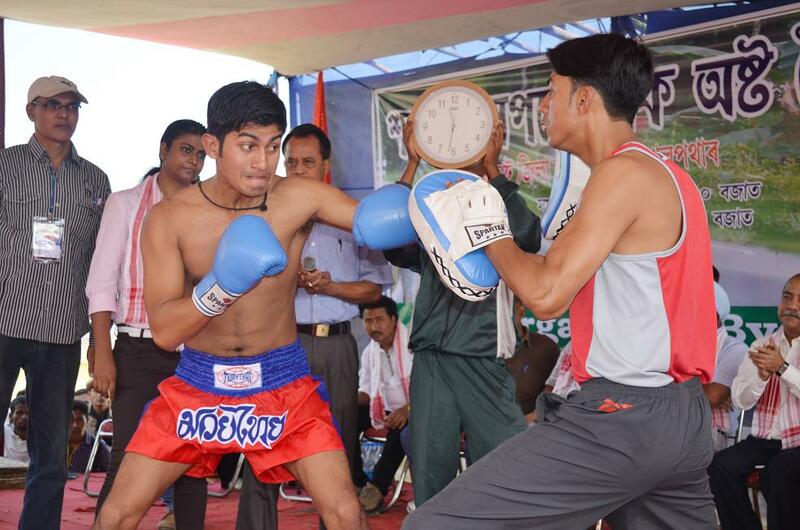 After a tensed break of 30 minutes, the adjudicator declared that the outcome of the 1 minute attempt was Abhijit delivering a whopping 329 full contact punches, at an average of 5 punches per second. He had actually delivered a total of 335 hits, but 6 of them had to be cancelled as they did not contact fully on the practicing pads. Abhijit was given a target of 120 hits as per the guidelines of Asia Book of Records and he had outdone the expectations of the onlookers. Abhijit had created a new record in the history of Asia Book of Records. 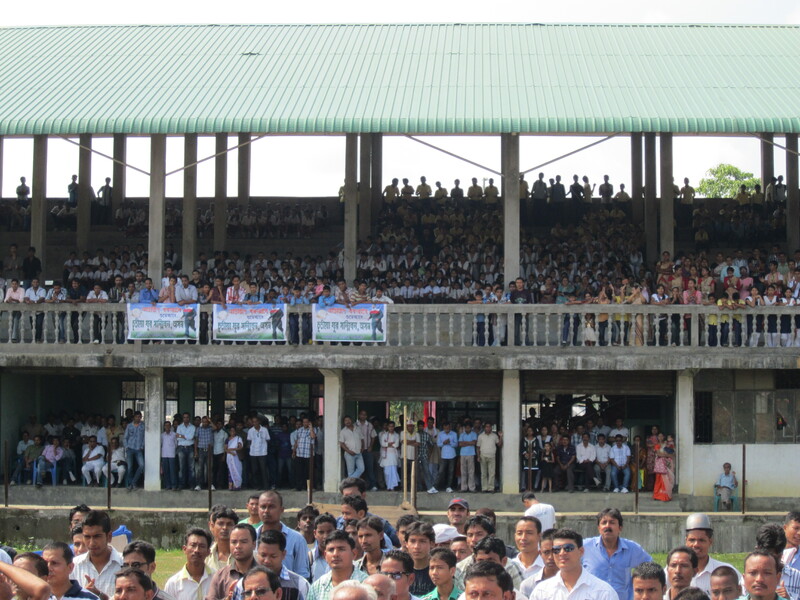 This attempt was the bookmark to an inaugural category as it had never been done in Asia Book of Records before. Delivering a total of more than 120 punches (at an average of 2 punches a second) naturally requires a lot of strength, courage, technique and most importantly proper support. It is never an easy task and is not a cake walk for a normal man who does not practice at all. If not done using proper skills, then it might cause some severe emergency in case of the person attempting it and the person holding the punching pads. But the duo Abhijit and Jayanta made this brave attempt, keeping in mind the huge expectations the Assamese people had from them. When asked about the source of inspiration for his love for record breaking, Abhijit replied “Breaking records is my passion and I would continue to do so to pinpoint the name of Assam in the World map”. He proved it to the world that if you have passion for something, then you can make anything possible. Asia Book of Records took the greatest pride in adding another shining record to its record book. Abhijit chipped in with a new category for us and Asia Book of Records salutes his efforts. Congratulations to him for having successfully completed what he aimed at. But, it should be specially mentioned that the event would not have been as success as it was without the supporting hands of the sponsors who were present day in and day out to make the event a memorable one. Congratulations to them as well! There is a special mention from our side that this feat should never be tried by anyone without being under the watchful eye of a trainer and is a downright no-no for the kids and the teenagers under 18. Comments for MOST PUNCHES ON A PRACTICING PAD IN A MINUTE are now closed.